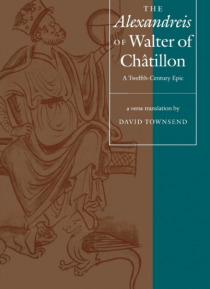 Written sometime in the 1170s, Walter of Chatillon's Latin epic on the life of Alexander the Great loomed as large on literary horizons as the works on Jean de Meun, Dante, or Boccaccio. Within a few decades of its composition, the poem had become a standard text of the literary curriculum. Virtually all authors of the thirteenth through fifteenth centuries knew the poem. And an extraordinary two … hundred surviving manuscripts, elaborately annotated, attest both to the popularity of the Alexandreis and to the care with which it was read by its medieval audience.